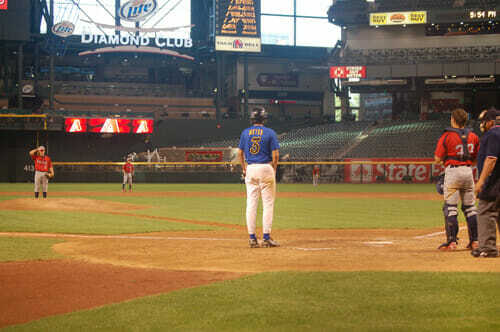 « Fighting the "Hegemonic Modern Human Rights Discourse"
My son got to play a high school baseball game today at Chase Field, right after the Diamondbacks game was over. It was really cool to see the kids on a major league field, though unfortunately his team ran into a buzz saw and lost. Asked after the game what he thought, he said " We gotta play 'em one day at a time. I'm just happy to be here. Hope I can help the ballclub. I just want to give it my best shot, and the good Lord willing, things will work out." My brother is doing something similar at the Metrodome soon. This must be a new MLB trend; rent out the stadium to high school kids. Did you let him watch Bull Durham or something? Did he thank God for his talent and say hello to Mom? Hey, it's a simple game, some days you win, some days you lose, some days it rains. The important its to play. Sometimes we won other don't; that's important leason to learn. Crash Davis would be so proud. No "We gave it 110 percent"?